Cook pasta until al dente. Heat 1 tbsp of the oil in a pan, add tomatoes. Bring to boil and cook for 4-6 mins, stirring and crushing until slightly reduced. In another pan, gently fry the chilli, anchovies and garlic in the remaining oil and butter (if using) for 1-2 mins, mashing the anchovies. Add the tomatoes, olives and capers to the chilli, anchovies and garlic. Cook for 2-3 mins, stirring. Drain the pasta and add to the sauce. Add the parsley, season and stir well to mix. Perfect for lunch or a quick weeknight tea. Pour a good amount (1-2 tbsp) olive oil into a small frying pan. Keep the heat low. Add the anchovy and, using a wooden spoon, mash it up as it starts to heat. When it just starts to sizzle, add the garlic and chilli flakes. Keep the heat low and fry gently for a minute or two. Don’t let the garlic brown. Turn the heat up a little and add the broccoli. Mix everything well together and then add the tomato. Simmer, covered, for 5 minutes or until the broccoli is just al dente. If it starts to dry out, add a tablespoon or so of the pasta cooking water. When the broccoli is tender, squeeze in the lemon juice and add the parsley and a good grinding of black pepper. You won’t need salt as the anchovies are very salty. Drain the pasta and add to the frying pan. Mix everything well together and serve immediately. Parmesan optional. I like it just drizzled with some really nice extra virgin olive oil and more black pepper. This recipe uses mafalda corta, a short, flat, ribbony pasta with a wavy edge from the Campania region of Italy. If you can’t find that, any other short pasta (such as penne or gemelli) with ridges to hold the sauce will work just as well. Pour a generous amount of olive oil in to a cold frying pan and add the garlic and rosemary. Put the pan on a low heat and let the garlic gently sizzle for a few minutes. Add the tomatoes and the cooked greens along with some salt and pepper and allow the tomatoes to cook down for a few minutes. Next add the chickepeas. Once they have warmed through, take a fork and roughly mash most of the chickpeas down (I like to leave some whole). Add some of the pasta cooking water a tablespoonful at a time and mix in with mashed chickpeas to make a sauce. Add the parsley and a squeeze of lemon juice. Taste and add more salt and pepper if needed. Drain the pasta and mix with the sauce. Serve straight away with grated parmesan and a drizzle of your very best extra virgin olive oil. A great lunch for the winter months – warming, filling and healthy. Kale, an under-appreciated member of the cabbage family, is packed with bet-carotene, folate and vitamin C so should keep the sniffles at bay! Heat some olive oil in a large soup pan and add the onion and a pinch of salt. Fry over a low heat, stirring, for about 10 minutes until soft and starting to colour. Add the garlic and chilli flakes and fry for a few minutes before adding the carrot and pepper. Mix well and cover. Leave to sweat for about 5-7 minutes until the vegetables have softened. Check and stir occasionally. Next, add the stock and simmer for 5 minutes or so before adding the pasta with another pinch of salt. Stir well and leave to simmer with the lid off until the pasta is nearly done. Add the kale and the beans and simmer until the kale is tender – about 5 minutes. Season with black pepper and more salt if needed. Garnish with the parsley. Normally, I would only advise drinking brandy but here it’s used in this very tasty pasta dish! Cook the tagliatelle in a large pan of salted water until al dente. While the pasta is cooking, fry the shallots and walnuts in olive oil in a large frying pan for a few minutes. Add the garlic and prawns with a pinch of salt. When the prawns have changed colour, turn the heat up and add the brandy. Allow to bubble for a minute or two then add the tomatoes. Cook over a medium heat until the tomatoes have broken down a bit. Then add the cream and allow to bubble away for a few minutes, stirring occasionally. Squeeze in the lemon juice and add the parsley. Add salt and pepper to taste. Add the drained tagliatelle to the frying pan and mix through with the sauce. Serve immediately and enjoy! Heat 1-2 tbsp olive oil in a frying pan and add the pancetta. Fry over a medium heat, stirring until crispy. Add the garlic and chilli and fry gently for a few minutes. Next, add the butter beans and fry, stirring before adding the chopped tomato and sun-dried tomato. Allow to bubble for a minute or two to let the flavours combine. Add some salt and pepper to taste. Drain the pasta and add to the sauce with the herbs. 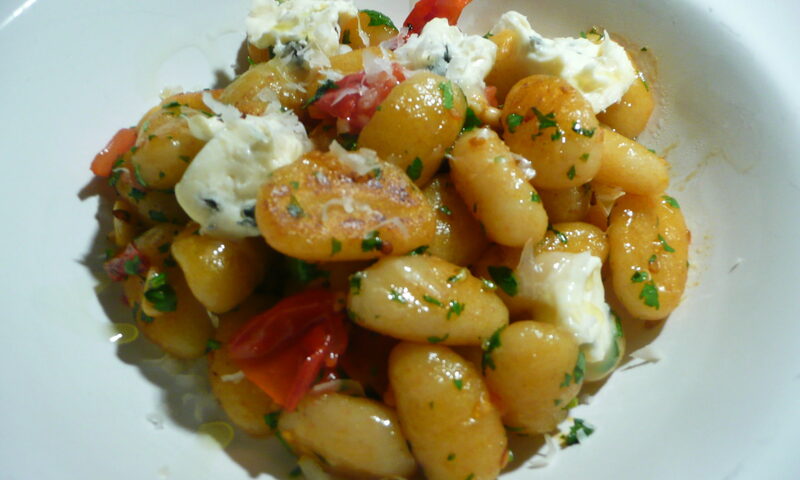 Mix well then drop in little nuggets of ricotta and add the parmesan. Mix gently so as not to break up the ricotta. Serve immediately. Cook pasta until al dente in plenty salted water. While the pasta is cooking, heat a frying pan and melt the butter and add the smoked salmon. Fry over a medium heat for a few minutes then add the peas. Stir through then add the creme fraiche. Heat through quite gently until peas are cooked and salmon is warmed through. Check seasoning and add salt if required. Add plently black pepper and herbs if using. When pasta is cooked, drain, reserving a little of the cooking water. Add salmon and sauce to pasta and mix well. Serve immediately. Cook the pasta in a large pan of well salted boiling water until al dente. Meanwhile, heat a large frying pan and add a couple of tbsp olive oil. Add the pancetta and fry over a fairly high heat until slightly crispy and most of the fat has been rendered. Remove the pancetta pieces from the pan with a slotted spoon and set aside. Turn the heat up and add the courgette and peppers to the pan. Fry on a high heat until the vegetables start to brown and caramelise. Keep moving them around the pan so they brown evenly. Add the garlic, chilli and thyme to the pan then add the vinegar to de-glaze. Return the pancetta to the pan. Add the tomatoes and break them down with a wooden spoon. Allow the sauce to simmer and reduce to quite a thick consistency. Season, remembering the pancetta is quite salty. Add the cooked pasta to the sauce and mix well. Serve in bowls with the grated parmesan sprinkled over.